Chang Ho Choi testing modified boot soles that generate electricity when flexed during walking. Energy harvesting devices could mean access to extended battery lifetime for soldiers travelling on foot. DST researchers have found that, under optimum conditions, shoe soles equipped with an energy harvesting kit, generated a significant power output when a subject walked during a test trial. 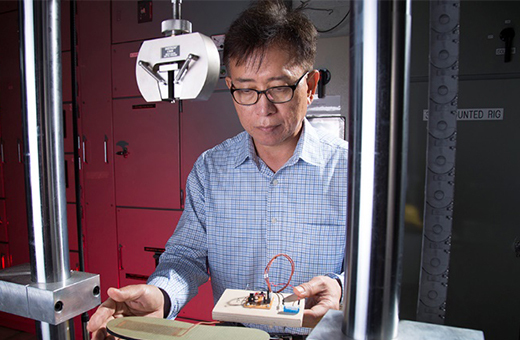 Defence researcher Dr Chang-Ho Choi and colleagues are keenly investigating this flexible power source. "We have been checking how much energy we can obtain from a soldier's movement: walking, jogging and running," Dr Choi explains. "We then compared those results with the output when we used our lab dynamic testing instrument which can simulate the shoe flexing. "The input and output patterns were almost identical, so it is now reasonable to set the lab instrument to "walking" rather than relying on humans in the loop (to literally, walk in a loop). The instrument flexes the sole enabling the endurance of the equipment to be tested. Having logged and analysed data from the lab and human participants, Choi's work will be on display at the International Conference on Science and Innovation for Land Power 2018 (ICSILP 2018). Dr Choi explains that the final version of any passive harvesting shoe electronics will not be noticed by the wearer. "We'll be aiming to miniaturise the electronics further, so that it can be a patch stuck under the inner sole," says Choi. "The 'mental penalty' on the wearer is at the forefront of our design considerations; if it weighs less than 200 grams then that penalty, and any physical penalty will be negligible." The team is considering charging alternatives, including wireless charging, and using the sole to power battery-free micro-sensor systems. "We've shown that the shape and design of the shoe plays an important role in maximising energy harvesting. Shoes that are flatter at the toe are better than angled ones for harvesting energy and increasing the stiffness of the innersole also significantly increases electrical output." Choi and colleagues will reveal at ICSILP 2018 how the design of the piezoelectric material on the innersole affects energy harvesting, as well as some interesting harmonic results to indicate that the harvester may need to be tailored to the weight and walking style of the individual for producing the best results. This technology, which may significantly change the way dismounted combatants travel, is one of several that DST is developing as a system of systems.